The Perfect Newborn Present Or Baby Shower Gift... Delivered Free Of Course! 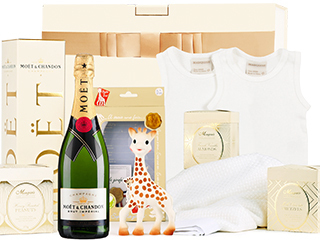 There is no other joy quite as grand as becoming a parent, and we have never been more proud of our luxury baby gift hamper range, and being blessed with the opportunity to be a part of such a special life occasion for our recipients. Here at The Hamper Emporium, many of us are parents and we understand just how important quality is when choosing the perfect baby gift. Our hampers are packed full of the best baby gifts you'll find; with the perfect blend of quality, luxury and affordability so that you can send a truly stunning newborn gift with a choice of affordable options to suit your budget. Our baby gift brands range from luxury children's wear brands, organic baby skincare brands, and world-favourite toys, teddies and storybooks, so that not only will these gorgeous baby hampers bring a smile to their faces on arrival, but also keepsake memories to look back on. How to Make a Baby Boy Hamper? We're Australia's Experts! If there's a time when quality matters, without a doubt baby gift hampers should be of the most beautiful quality to keep baby cosy and safe. Our baby hampers for little boys usually contain a lot of blue-themed products; this includes plush toys, clothing, and baby books. We know that keeping baby healthy and safe is always of the highest priority which is why we love including organic baby skincare, organic baby bath products, hooded towels, and more products that could be used at bath time. Basically, our suggestion for the best baby boy gift hampers is always to include the best quality possible with a range of gifts that are practical and comfy so that mum, dad and baby are all happy. What Do You Put in a Baby Shower Hamper? Looking for a baby hamper that could be gifted for a baby shower? When choosing the perfect gift idea for a baby shower, it's always a great idea to include essentials for the baby. Our entire range of baby gift hampers are great baby shower gift ideas, as they include a range of practical baby gifts from some of the world's most amazing baby brands. 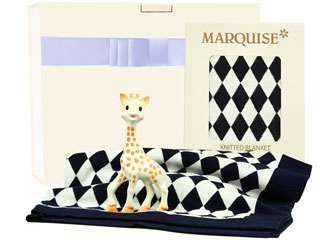 Often we'll include goodies such as a teether, baby clothing, and baby bath products. Baby shower gifts can be tough, particularly when it hasn't yet been revealed what gender baby will be. When thinking about what baby shower gifts are best, we always recommend our gender neutral baby gift hampers. 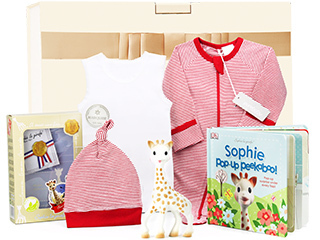 They are packed full of the finest quality in baby clothing, skincare and toys, and we've carefully selected gifts that work for both baby boys and baby girls so you don't have to worry. What to Put in a Baby Girl Hamper? Little baby girls are oh so sweet, and creating the perfect gift hamper for baby girls is such a special thing to do. When we're selecting our baby hamper products, we've ensured that each and everyone is safe, high quality, practical for parents and comfortable and fun for baby. We've done this by working with the world's best baby brands including EcoStore and Nature's Child. Little girls will also absolutely adore the cuteness of Sophie La Giraffe. Our team selects some of the best toys, but also delightful baby books and high-quality baby clothing. So, if you need some inspiration for a baby hamper, be sure to check out how the experts at The Hamper Emporium create them, and know that no matter which of our hampers you choose to have delivered to your recipients, it will arrive beautifully presented and full of amazing gifts at an affordable price and all with FREE Delivery. How Do You Wrap a Baby Hamper? We Do it For You Of Course! The presentation of a baby hamper is just as important as the items inside, because we know first impressions count. Fortunately, The Hamper Emporium takes care of hamper presentation for you, so customers our customers don't have to worry about wrapping our baby hampers. We've spent over a decade as Australia's best-selling gift hamper experts and we've refined our entire product to create a beautiful custom keepsake gift hamper box that's tucked beautifully inside our custom postage boxes. Our entire process from postage to beautiful products is luxurious at every step of the way. Our baby hampers are always presented in a gorgeous keepsake box. The keepsake box usually has a neutral crème colour; this ensures that the hamper is suitable for both girls and boys. Of course, our baby boy gift hampers often will include a satin blue ribbon, and our baby girl hampers will often have a baby pink ribbon, and our gender neutral hampers are perfect no matter what baby's gender turns out to be. What Are Australia's Most Popular Baby Shower Hampers? We've spent many years perfecting our gift hamper range, including our sell-out baby hamper range. We're always trying new things, gauging feedback from our customers and their recipients and working with the world's best brands to create an ever-popular baby gift hamper range. We love sending baby shower hampers because we know just how special life is about to become for the lucky parents. At The Hamper Emporium, one of our favourite baby gifts is our Guess How Much I Love You Hamper. Our hamper experts have created a dedicated version for girls and boys, so make sure to pick up the right one if you decide to choose the most popular hamper in our collection. Even though the hampers are designed for girls and boys specifically, the products inside the hamper are inherently the same, but vary in colour. Products that can be found inside the Guess How Much I Love You Baby Hamper include a plush hare toy, baby clothing, books, and a nice selection of nibbles for mum. Not quite sure about the gender of the baby? No worries, since there is also a neutral Guess How Much I Love You Baby Hamper; this hamper can be gifted to both girls and boys. For parents who prefer organic and natural products for their newborn, we recommend the Natural Collection Baby Hamper. The Natural Collection Baby Hamper only contains organic and natural products, featuring brands such as EcoStore. 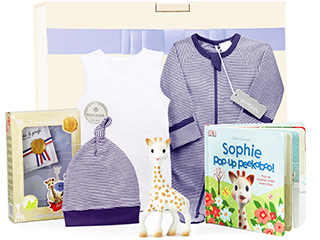 The Natural Collection Baby Hamper also comes with an interesting extra, more specifically the Sophie La Giraffe Teether. The teether is made from natural ingredients, including food-grade paints and natural rubber. Of course, the teether is also functional, providing the baby with some much-needed relief once the teething process kicks in. Peter Rabbit has been one of the most popular baby characters for years, so it is no surprise that many baby toys and items are embellished with the likeness of Peter Rabbit. If you have been looking for a hamper that is jam-packed with Peter Rabbit toys, then we certainly suggest the Peter Rabbit Baby Hamper. 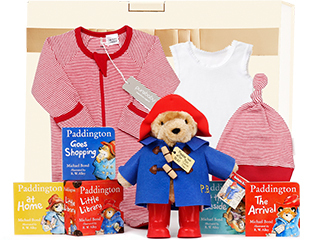 The Peter Rabbit Baby Hamper in our collection contains everything Peter Rabbit lovers want. It contains a Peter Rabbit toy, storybook, bib, clothing, and even a food set. So, it is no wonder that the Peter Rabbit Baby Hamper is one of the most popular choices at The Hamper Emporium. What Is the Best New Baby Hamper? To ensure our range of baby hampers stays fresh and interesting, our team regularly adds new baby hampers to the collection. Curious what our recommended new baby hamper is? It is the Gumnut Babies Baby Hamper. The Gumnut Babies Baby Hamper is a beautifully Australian inspired gift hamper that celebrates the joy of Aussie favourites May Gibbs' Gumnut Babies. 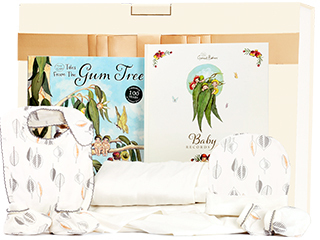 Featuring a beautiful Gumnut Baby Keepsake Book, Gumnut Babies Book and gorgeous bamboo fibre clothing and baby accesories with adorable leaf print, this is such a beautiful gender neutral book that's perfect for baby showers, or baby's first days. The products inside our baby hampers are incredibly versatile, and this is also needed considering how many baby gifts are available nowadays. Inside our baby hampers, you can easily find essential baby items such as singlets and growsuits, but also more unusual items that may benefit the baby, more specifically organic bubble bath, shampoos and teething rings. Our hampers are also diverse where gender is concerned because we have numerous neutral hampers that could be gifted to both girls and boys. So, if you still need a baby or christening gift this year, be sure to take a good look at our extensive collection of baby hampers. What Can I Do If I Cannot Decide on a Baby Hamper for Mum and Bub? Cannot decide on a hamper? No problem, because The Hamper Emporium has an entire team at your disposal. Contact us for some additional assistance and some recommendations, and we are sure you will find the hamper you are looking for. Don't forget, all our newborn baby gift hampers include free delivery Australia-wide.